We live in interesting times. The government and mainstream media would have us believe that these are times of austerity. Of course we live in no such thing. The miniscule efforts made by the government thus far has already resulted in much gnashing of teeth and yet for the 2012-13 financial year the UK government still borrowed £120.6 billion that it didn’t have. Every UK based man, woman and child just added a further £1,925 onto the tab. So if we don’t live in times of austerity what are we living in? I think I’ve managed to find the answer. It’s officially called Financial Repression. Please do click on the Wikipedia link and let me know if you agree? It looks to be a method that allows the masses to be a slowly boiled frog as most won’t notice what is going on due to a money illusion. What makes me think this is the route chosen by our politically masters? We all know that the Bank of England has been ignoring the 2% inflation target for a long time now but the new Remit for the Bank of England Monetary Policy Committee dated 20 March 2013 now explicitly sanctions it with the statement that “The remit recognises that inflation will on occasion depart from its target as a result of shocks and disturbances. Attempts to keep inflation at the target in these circumstances may cause undesirable volatility in output. This reflects the short-term trade-offs that must be made between inflation and output variability in setting monetary policy. It therefore allows for a balanced approach to the objectives set out in the remit, while retaining the primacy of price stability and the inflation target.” This gives new Governor Carney official free reign to keep the Official Bank Rate at near zero while continuing to Quantitative Ease (QE) like there is no tomorrow. The aim here seems to be to keep inflation running without allowing it to run away. It will be interesting to see if they can walk that tight rope. So we now have the inflation. Next you need to control and drive interest rates, such as on government debt, to a value that is less than the inflation you are creating. QE is and will come to the rescue here by creating a major buyer, in this case the Bank of England. Basel III then creates another buyer, in this case Banks, by requiring Tier 1 capital levels to be increased from 4% to 6%. Banks can count government debt as Tier 1 capital creating an additional domestic market for government gilts. Lots of buyers means rising prices and falling yields. This has also created a captive domestic market for government debt which Financial Repression requires. I feel we now have most of the Financial Repression boxes ticked. Interest rates are controlled, the government owns plenty of banks, reserve requirements are rising and we have the domestic market for government debt. The one that is missing is capital controls but our Cyprus friends have shown us how easy that is to implement when the time is right. With Financial Repression in place we have now created an environment of negative real interest rates to allow erosion of the value of the government debt in real terms. Sounds like a great plan except the bit the government and Bank of England seem to have missed is that they don’t have the deficit in control and so the debt won’t actually reduce in real terms. The UK is currently in debt to the tune of about £1.2 trillion so with a deficit of £120.6 billion the debt is growing at about 10% year on year. Therefore they’re either going to have to cut that, which seems politically impossible with modern day “democracy”, or we’re going to need some more inflation. Is that why they’ve given the job to Mark Carney? Of course negative interest rates combined with inflation is good for borrowers (and there is no bigger borrower than UK PLC). However these conditions also destroy savers at the same time. That is clearly a price that has been agreed is acceptable to pay however I’m thinking the Government and Bank of England have missed another important point. This will also destroy average workers in the process unless their salaries can also rise with that rate inflation. Last time we had Financial Repression we had those salaries increase and so managed to get away with it. This time I think is different. In the modern globalised world UK salaries are already considered high and so it is unlikely they will be able to rise nominally let alone in real terms where a cut is actually required if we are to once again become competitive and rebalance our economy. So in my opinion real salaries will continue to fall. Therefore can costs be cut in real terms to help the worker maintain standard of living? That seems unlikely. Inflation in food and energy doesn’t look like it’s going to lower over the medium to long term. One option would be for the rent seekers of society to take a healthy haircut but I can’t see that being politically acceptable. So the average punter will be squeezed with his real salary falling while real costs are rising. 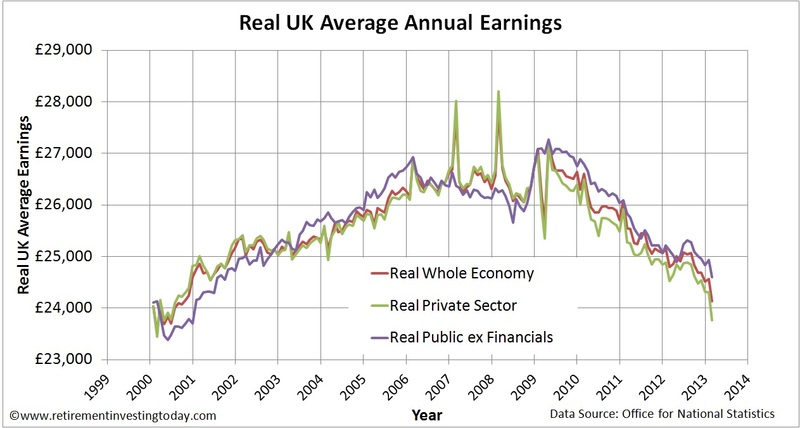 Let’s look at the Earnings for the UK to see if real salaries are indeed falling. The Whole Economy including bonuses and allowing for seasonal adjustment is £464. This is down £5 (-1.1%) against last month and up £2 (0.4%) year on year. The Private Sector earns less than the average Whole Economy at £457 per week. Private Sector Earnings have fallen 1.5% in the last month and have gone nowhere year on year. The Public Sector earns more than the Private Sector at £485 per week and also continues to do better than the private sector when it comes to securing pay rises. Month on month we see a 0.6% fall but year on year an increase of £6 (1.3%). Unfortunately, while we were seeing those monthly falls and either stagnant or small annual increases inflation according to the Retail Prices Index (RPI) was 3.2% during the same period. So no matter whether you are Private or Public Sector you are likely taking a pay cut while many of the things you buy are likely to be increasing. Therefore the squeeze is indeed underway. 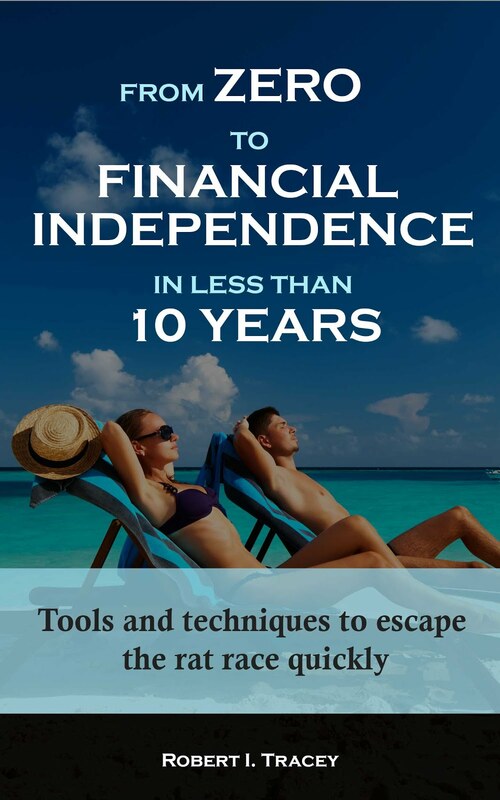 Anyone chasing financial independence (actually anyone for that matter) should be again looking at costs and earnings potential to try and maintain that percentage of savings. This year I’m going to call myself one of the fortunate ones. After a 0% kick in the teeth (sorry salary review) last year, this year at my recent review I managed to get a 3.5% increase following a very good year. That means my salary in real terms has held pace which should allow me to maintain my savings rate without too much difficulty. The long term erosion of spending power can be best seen with a couple of charts. 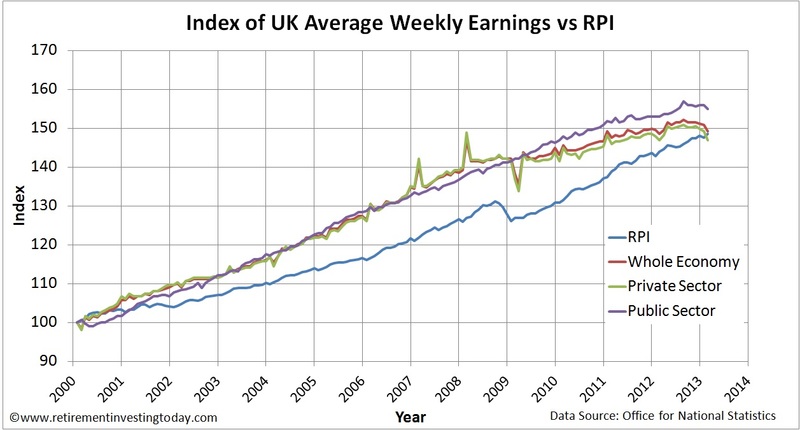 The first chart takes the RPI and Average Weekly Earnings and then converts them into an Index that starts in 2000 with a value of 100. Whenever the gap between Earnings and the RPI is increasing earnings power is increasing. The chart shows this stopped happening around 2008 meaning we have been seeing spending power erosion since then. Today the spending power of the whole economy is back to levels last seen in October 2000. My second chart then converts Weekly Earnings into Annual Earnings and then corrects for Inflation to give Real UK Average Annual Earnings. This chart highlights an interesting phenomenon. 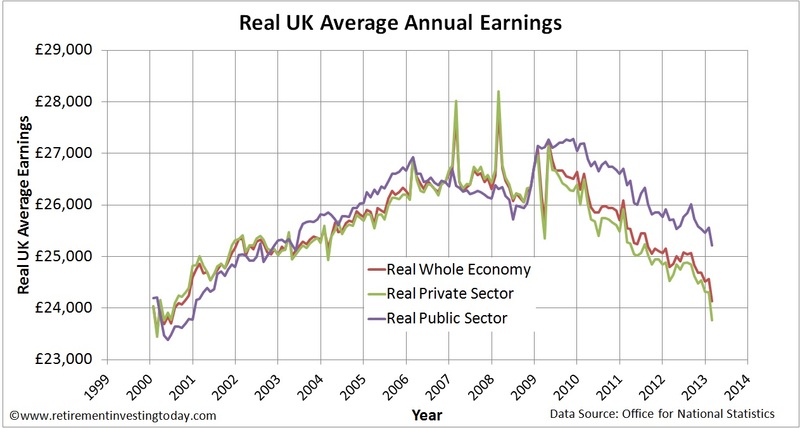 Look at how since 2009 Public Sector Earnings have diverged from Private Sector Earnings (as highlighted above). This was caused by a large portion of the UK Financial Sector becoming Public Sector workers in late 2008. If we filter that out we end up with my third chart which shows that while the Public Sector excluding Financial Services on an annualised basis is still doing better than the Private Sector. Will the workers of the UK be able to tolerate the Financial Repression being imposed on them? Only time will tell but for now they seem to be putting up with it. 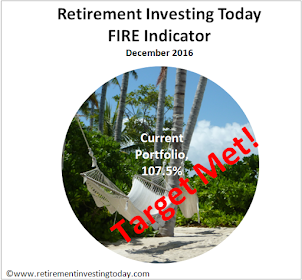 Did you overlook another mechanism for keeping interest rates low - requiring pension funds to buy lots of Gilts? "Will the workers of the UK be able to tolerate the Financial Repression being imposed on them?" What do you suggest instead? Real austerity? Default? Higher inflation? Why do you think parties like UKIP, NF in France, 5star in Italy etc are taking about a quarter of the national vote? did you overlook that that the BOE asset purchase program has bought 375bn gilts and that these effectively can be discounted from the national debt, as can all further QE purchases. With this in mind there is a lot more wiggle room for the establishment. Have a read - good article. The arc of real wages will in time be the same for house prices, the elephant in the boiler room that is the UK economy. Seems to me that house prices are a function of our monetary system (fractional reserve banking, government underwriting of savings...) which allows excessive lending. Excessive lending being not just subprime, where people can't repay their loans, but also (the bigger Issue in the UK) where it leads to house price inflation as prices are bid up, and out of reach of many people. One option which I didn't pick up above is to look at monetary reform, to address some root cause factors around how money is created, and impacts on the national debt levels and specific cases such as house prices. Positivemoney.org.uk has some good content on this- food for thought! > Today the spending power of the whole economy is back to levels last seen in October 2000. > After a 0% kick in the teeth (sorry salary review) last year, this year at my recent review I managed to get a 3.5% increase following a very good year. That means my salary in real terms has held pace which should allow me to maintain my savings rate without too much difficulty. I'm always amused that there's this blind, blanket assumption that government borrowing is a Bad Thing (less amusing, of course, is the wilful destruction of the public sector which is supposedly justified by the borrowing being such a terrible thing). When a government can borrow large amounts of money at sub-inflation yields, which can then be invested in the future of the country, I'd argue that not only that perfectly acceptable, but that they have a moral obligation to do so. Once normalised for the differences in occupations between the private and public sectors, there is no pay gap. Just a cheap target!